Florence, Italy is one of Italy's great cities and the local people are cheerful, friendly and generally very helpful. Good manners are welcome everywhere and expected by most people. Florence is undeniably a major-league cultural and historic city and worth a visit, whatever the time of year. Most Italian words are pronounced exactly as they are written, syllable by syllable, and there is often an emphasis on the last letter. A knowledge of Latin can be useful, both as the basis for Italian and also for reading the inscriptions on many monuments. Although Italian is the language of the land, English is generally understood and usually spoken to some degree at most Florence attractions, museums, hotels and restaurants that cater to visitors. In smaller towns and villages nearby, a phrase book is a useful item to carry. 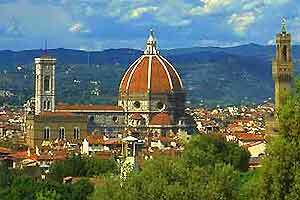 The people of Florence are very religious and enjoy going to church on a regular basis. There are a large number of churches in the city that welcome visitors and some even hold masses in English. In many buildings and public transport, rules restrict smoking and this is usually indicated by no-smoking symbols in prominent places. Most pubs and bars in Florence welcome customers who wish to relax with a drink and smoke, as a high percentage of Italians are smokers. It is always worth exercising discretion and sensitivity when selecting a place in which to smoke. The best advice would be not to smoke unless others around you do so. The Euro is made up of eight coins and seven paper notes and was introduced on January 1, 2002. The 12 original members of the European Union - Austria, Belgium, Finland, France, Germany, Greece, Ireland, Italy, Luxembourg, Netherlands, Portugal, and Spain - planned the event for more than a decade, determining a conversion rate for each country's national currency. The colourful Euro bills, which include holograms and shades of green, yellow, blue, mauve, and orange, are identical across the Euro area. Coins have one common and one national side, but they can be used in any of the member countries, regardless of the country of issue. Old currencies are no longer accepted, although they can still be converted to Euros in central banks. Tipping in Florence is quite discretionary, with taxi drivers usually being given a small gratuity. Restaurants in Florence often include service charges and these are always clearly stated on the menus, although a small tip will still be expected. In Italy, even theatre and cinema usherettes expect a tip for showing you to your seat. Hotel staff, such as luggage handlers, happily accept a small tip. Generally, no other public service workers in Florence expect tips. You should always pay tips in cash, as this way you can be sure that the person it is intended for receives it fully. 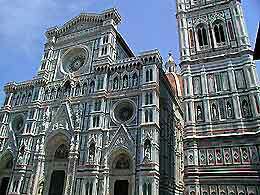 The Florence tourism and tourist information service has several offices in the city centre that provide a wide range of information about tourist attractions, Florence accommodation, events and general Florence tourism information. The most convenient tourist office in Florence is the one close to the Duomo and the Palazzo Medici-Riccardi at Via Cavour. 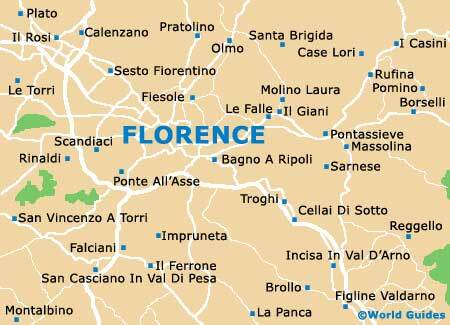 There is at least one tourist office open daily in Florence all year. Elsewhere offices may close in the afternoon out of season and offices in nearby villages have more limited opening times. The biggest threat in Florence is by bag-snatchers and pickpockets and thieves operate on foot and by moped. The thieves are very skilled, so be particularly careful with hand baggage. Wear a bag or camera across your body, or even use a concealed money belt. Also, ignore any illegal touts, who offer services such as arranging parking and finding hotels - although generally the city is free of con-men. VAT (IVA) is always included in the price and refunds are unusual in Italy. Tourists from countries outside of the EU may claim a refund on this tax if the item was purchased for personal use and cost more than a certain amount. Ask the shopkeeper for details.